ALL SMILES: Mount Gambier young pony trot drivers Amity Formosa, Bryce Bygate, Holly Phillips, Marnee Formosa, cup winner Evie Sealey, Keeley Formosa, Nicola Bowditch, Mikayla Bowditch and Amber Formosa are all smiles at the Mount Gambier Pony Trot Gold Cup presentations at Greenwald Paceway on Saturday night. 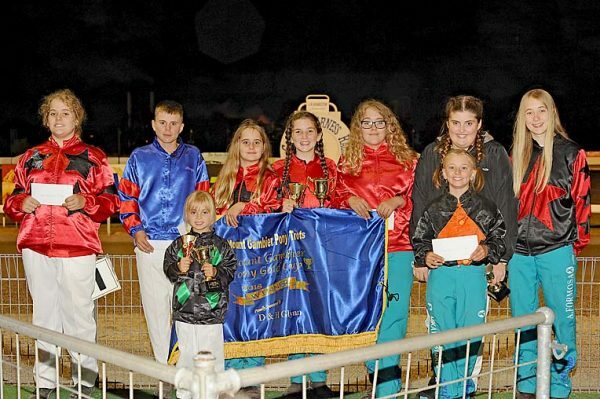 A TOTAL of nine young drivers took part in the Mount Gambier Pony Trot Gold Cup and Prelude at Greenwald Paceway on Saturday night. The biggest field of the year prepared for the Prelude, which saw Holly Phillips and Super Marley off the front-mark.